and the completion of the 70th full year of Disney’s company union (on Sept 21). Ok, it’s pop-culture honey for hornets to point out a Walt Disney scandal. As an icon of childhood innocence, it’s unfortunate (and predictable) that his name has been tarnished by attention-seeking mudslingers. I am not one of them. 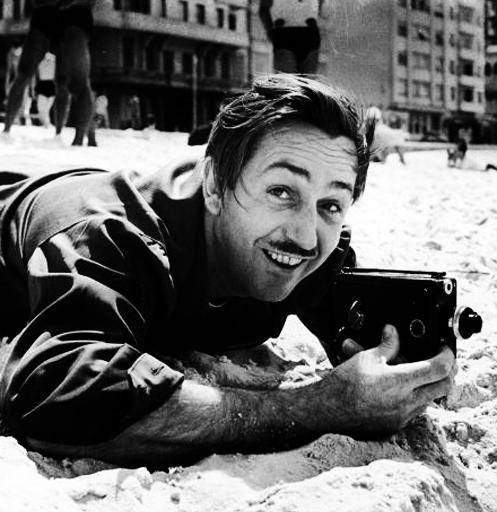 I have incredible respect for Walt Disney as a storyteller and entrepreneur. The man is the living embodiment of the American Dream. And I’m educated enough in the history of the animation industry to know that, though he didn’t actually draw a frame of animation, he was still an artist of story, and a decent fellow with very human qualities. 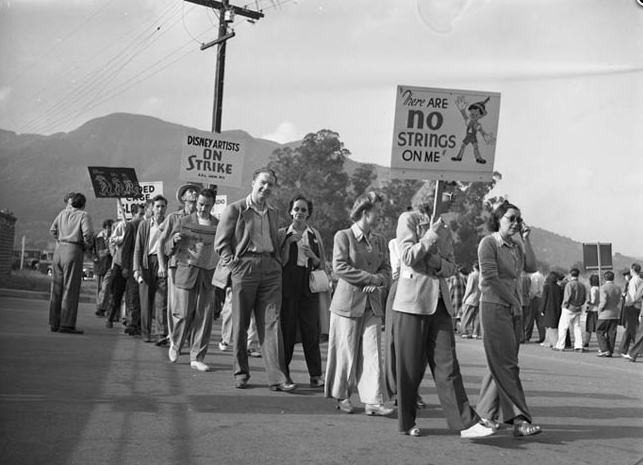 Those who did draw those frames – 330 artists, in fact – are the ones who were on strike outside the Disney studio gates in 1941. It even looks like the occupy movement! There was a vacant grassy lot across the street. It was convenient, and it overlooked the studio. Their picket signs were emblazoned with images of Disney characters, and against the cloudless summer sky, it must have been quite a sight. Professionally-rendered Disney characters protesting their own creator – now that’s moxy! 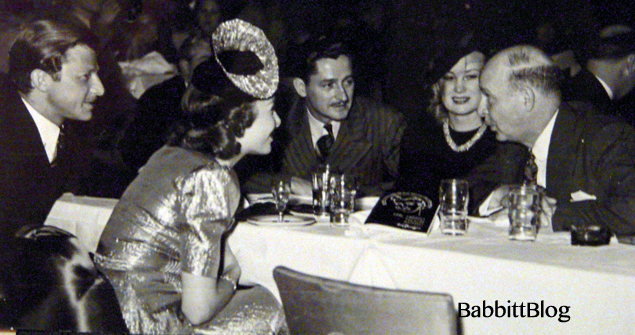 Union talk had been in the air for some time before the 1941 strike. The 1930s was the heyday of Hollywood unions, birthing the Screen Actors Guild, Screen Writers Guild, and several others that are still in use today. Disney’s lawyer, a bald gopher of a man named Gunther Lessing (see photo at top), had devised “company unions” to placate the artists and keep the feds off their trail. Yes, there was a time with the President of the United States supported unions enough to create the National Federation of Labor! Imagine the government waltzing in and arbitrating a labor dispute in favor of the strikers! President Roosevelt had been a New York governor – and that’s a significant thing when Manhattan was still reeling from the Triangle Shirtwaist Fire that killed 146 trapped laborers. Roosevelt inherited a failing economy in 1933, and spent his first 100 days in office composing bills to alleviate the Depression (that’s where the “first 100 days” watchdogs got the idea). Roosevelt’s New Deal initiatives were blocked again and again by the Supreme Court, often being labeled “unAmerican.” (I mean, “New” is good! “Deal” is good! What’s not to like?) Of course by the economic depths of 1940, Capitol Hill had allowed the president more leeway. Enter Art Babbitt. One of Disney’s creative circle. And a New York liberal. Babbitt had come from New York City, having spent his young adulthood working in Manhattan as a commercial artist and animator. He lived in the grit of Brooklyn back when it was truly gritty, and he struggled as the main breadwinner in his family of six. 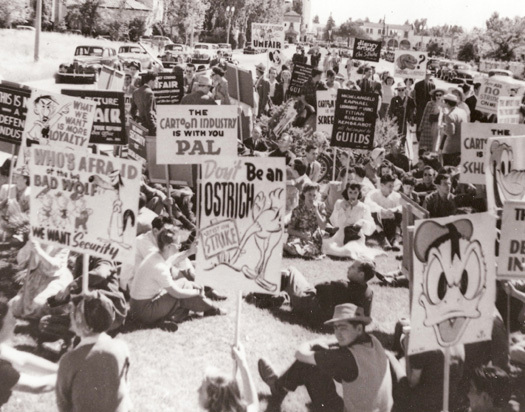 Even after earning a high salary at Disney’s, Babbitt continued talking about labor rights with his coworkers. In 1941 he was fired for union activity – an illegal move on the company’s part – and the next day the strike was called, with Babbitt as its key leader. From May 29th through August, Walt’s company was in business turmoil. The National Federation of Labor finally stepped in and voted in complete favor of the union, but it wasn’t until September 21st that artists were re-hired (with back-pay), and that work started to find its normalcy once gain. It didn’t come easily or quickly, but the Occupiers had a complete victory. Today it’s a thought far from the minds of Lion King fans and princess wannabes, but as this summer closed, the Walt Disney company celebrated its 70th full year as a union shop. What tickles me most about it is that somewhere on the planet, a top CEO – the type who fights unions – is enjoying a Disney film with his or her child. That film wouldn’t even exist if not for the success of the labor strikers! That, and the idea that a child in the highest tax bracket is watching the same Disney animation as the rest of us. The 1%ers who settle for nothing but the best of everything are watching the same Disney masterpieces the rest of us are – thus making Disney animation one of the few great equalizers on the economic front. And these masterpieces would not have been made if not for gutsy animators who risked everything. This entry was posted in 1941: The Disney Strike, Animation, California, Disney, FDR, Film, Labor, miscellaneous, OWS, politics and tagged 1940s, 1941: The Disney Strike, Animation, Art Babbitt, Disney Studios, Gunther Lessing, Hollywood, Les Clark, Marge Champion, Walt Disney. Bookmark the permalink. I think it’s certainly a very interesting perspective. Walt Disney and I would probably disagree politically but his animated works are still fascinating. And the artists who really helped develop the style were all so diverse so it’s actually quite an achievement they managed to work together.